While you might be familiar with iFixit from its in-depth teardown guides meant to provide the ultimate resource for DIYers, it also offers the necessary tools to get the job done. We told you a while back about its “iPhone oppression kit” allowing you to swap out Apple’s pentalobular screws with standard Phillips screws. Stemming from a discovery of two unused mounting points in its recent 21.5-inch and 27-inch iMac teardowns, iFixit is now providing a kit that provides all the tools necessary to install a second hard drive in your mid 2011 iMac. The iMac Mid 2011 Dual Hard Drive Kit ($69.95) is available for both the 21.5-inch and 27-inch models and comes with a Custom SATA power cable, SATA data cable, custom-cut 3M VHB double-sided mounting tape, two heavy-duty suction cups, spudger, and a 26 piece bit driver kit. 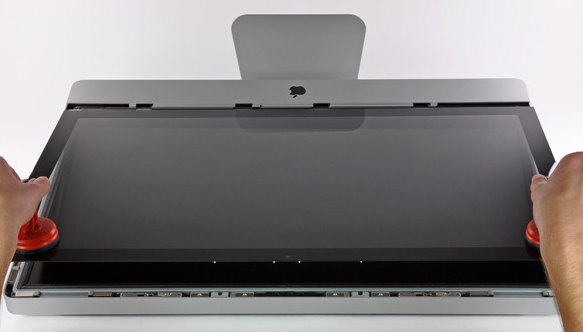 Of course, the suction cups are for removing your LCD to get inside the iMac (pictured right). It is definitely not the easiest second hard drive installation, but iFixit put together detailed instructions for both models here and here. The kit does not come with the hard drive itself, so for that you will have to get your hands on a 2.5-inch SATA drive. iFixit recommends installing “OS X on an SSD for lightning fast startup times, while still being able to use your original hard drive for mass storage.” Or you can always just toss a 1 TB HD in there for storage. The iMac never leaves your sight, so you keep your data secure. * You can use any hard drive or SSD you’d like. * You learn something during the process of taking apart your iMac. * Two-way international shipping of an iMac is insanely expensive. Current solutions on the market require you to ship your iMac to the U.S. if you want a second drive installed. Originally released in 1998, the iMac is Apple's all-in-one desktop computer. The current version (2019 model) offers 21.5" and 27" 4K and 5K displays.